Today, Herjavec Group is recognized as a global leader in information security specializing in managed security services, compliance, incident response, and remediation efforts for enterprise level organizations. In this exclusive, he shares his experiences with IT privacy, the entrepreneurial state of Canada, and his thoughts for advancements in the future. Mediaplanet: What inspired you to get into the world of technology, and more specifically, the world of IT privacy? Robert Herjavec: I didn’t know any better – I was working in film and eventually I could not take the lack of security. My roommate went for a job interview with a guy who ran IBM marketing and was starting a new business. I couldn’t believe people held a steady job. I talked my way into the interview and then inevitably the job, having no tech or sales experience. I had to work for free for six months. It was the best investment of my time – ever! The information security industry and the need for privacy, for both consumers and businesses is growing at such a rapid pace. As a business innovator you always want to find a growing opportunity, and since that first interview I’ve always known IT was for me. MP: Could you sum up the entrepreneurial state of Canada? How does this compare to the United States? RH: Entrepreneurship is alive and well in Canada. America does not have the exclusive rights for ambition – it is not the “American Dream“ – it is the human condition to want to better our lives. It doesn’t matter where you come from, what race, religion, shape, size etc. It’s an innate motivation to want more. That passion is thriving in people today worldwide. We see it on Shark Tank every Friday, but in the tech space I get to live and breathe that sense of innovation and creativity every day. MP: What qualities do you look for in emerging technology companies? RH: I tend to look at one of two types – ones that solve an existing problem through the use of technology or ones that create an entirely new market, where ones did not exist before. MP: What is your take on all of the news about Edward Snowden and recent privacy breaches? Have these events sparked innovation in Cloud/Enterprise security and the way we host data? Have they affected adoption levels of the cloud in Canada? RH: The need for easier access to data has to be balanced with the need for security. Security will always be a major issue as long as human beings need access to it – because by nature, humans are imperfect. There is no stopping the cloud model or the easier access to data – easy always trumps complex. But enterprises are not spending enough time looking at secure cloud communications. Let’s not forget clouds are porous – everything falls through them. And worse, clouds can also be storm clouds. To protect an enterprise, organizations require a strategy and execution. Cloud services enable organizations to rebuild the right way, with the appropriate security controls. We are seeing more and more organizations leverage cloud services to move quickly and efficiently. We are also seeing organizations who fear the cloud simply because they do not understand it. This often leaves them far more exposed and allows the competition to get ahead of them. MP: What are some of the major advances you expect to see in enterprise technology over the next five years? Ten years? RH: We are moving into the hyper-connected world. Everything will be connected. In fact being connected will be obsolete, because we just will be. The internet will become like electricity – we will only notice it when it does not exist. Our access points will grow by a thousandfold and all of those access points are new potential vector points in the battle of security. Welcome to the internet of everything – but be beware, someone is probably watching you. Big data and cloud computing will continue to grow and take over the way we run our networks and analyze data. Organizations will move away from hosting their own physical environments and investing in large teams of IT personal. Today we are seeing organizations moving core functions like security, web, and email to third-party providers who specialize in these fields and can do it much better, faster, and more cost effectively. 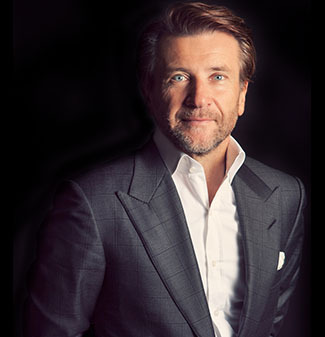 Robert Herjavec is a featured speaker at Interzone, March 11-13th at the Fairmont Banff Springs. Herjavec will be delivering a keynote address and sitting on the Subculture judging panel with Steve Wozniak, Bruce Croxon and Christine Herron. See the original article on Cloud Computing here.